Halter Moss Point Yard. Also two hauling winches and two ladder hoists are under construction for installation on the Corps of Engi- neers dustpan dredge "Hurley" un- der construction at the yard. Twelve 21-inch electric two speed capstans are being built for Ala- bama Shipyard for installation aboard the crane barges currently under construction at the yard. Four 21-inch hydraulic capstans are be- ing built for Bender Shipbuilding and twelve 21-inch hydraulic cap- stans and stern rollers are being built for Trinity Marine. This equip- ment will be installed on the oil spill recovery vessels being built at both of those yards. Marine for installation on the Chev- ron barge currently under construc- tion. Sause Bros. Ocean Towing recently placed an order for one mooring winch, one combination mooring winch and one anchor wind- lass for installation on two of their existing offshore support vessels. Gulf Coast Air & Hydraulics. Established in 1915, McElroy's engineering and design capabilities have been developed over the years to meet the marine industry's rigor- ous requirements for more complex machinery. McElroy's manufactur- ing capabilities are evident in the diverse line of equipment now being built. Their product range covers small single drum mechanical winches weighing only 25 pounds, up to double drum diesel driven winches weighing in excess of50,000 pounds. Hydraulic, diesel and elec- tric drive packages are available on winches and other deck machinery. Vessels utilizing McElroy's equip- ment include offshore supply boats; utility boats; tug boats and line han- dling boats; commercial fishing ves- sels; military vessels for the U.S.
Coast Guard, U.S. Navy, Army Corps of Engineers and foreign navies. Specialized vessels, including fer- ries, seismic research vessels, fire boats and dredges, also constitute a large part of McElroy's markets. U.S. Navy for installation aboard Navy tugs. When you're trying to keep everything o rd running smoothly, you need advanced' - - - Jon boar advanced ways to secure your lines of communication with the outside world. 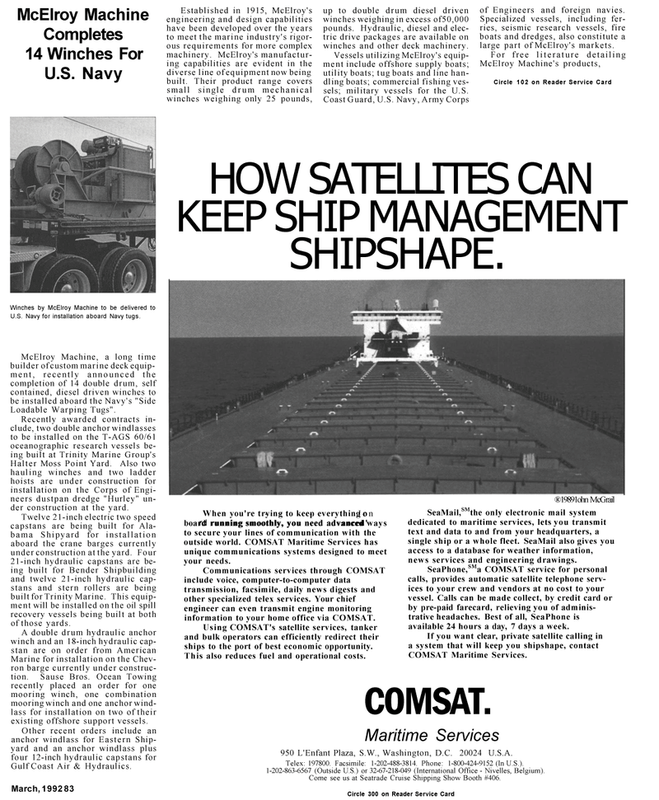 COMSAT Maritime Services has unique communications systems designed to meet your needs. Communications services through COMSAT include voice, computer-to-computer data transmission, facsimile, daily news digests and other specialized telex services. Your chief engineer can even transmit engine monitoring information to your home office via COMSAT. Using COMSAT's satellite services, tanker and bulk operators can efficiently redirect their ships to the port of best economic opportunity. SeaMail,SMthe only electronic mail system dedicated to maritime services, lets you transmit text and data to and from your headquarters, a single ship or a whole fleet. SeaMail also gives you access to a database for weather information, news services and engineering drawings. SeaPhone,SMa COMSAT service for personal calls, provides automatic satellite telephone serv- ices to your crew and vendors at no cost to your vessel. Calls can be made collect, by credit card or by pre-paid farecard, relieving you of adminis- trative headaches. Best of all, SeaPhone is available 24 hours a day, 7 days a week. Maritime Services 950 L'Enfant Plaza, S.W., Washington, D.C. 20024 U.S.A. Telex: 197800. Facsimile: 1-202-488-3814. Phone: 1-800-424-9152 (In U.S.). 1-202-863-6567 (Outside U.S.) or 32-67-218-049 (International Office - Nivelles, Belgium). Come see us at Seatrade Cruise Shipping Show Booth #406.